In Freital, Abu Hamid and his fellow refugees were attacked by right-wing Germans, who could be convicted of terrorism. 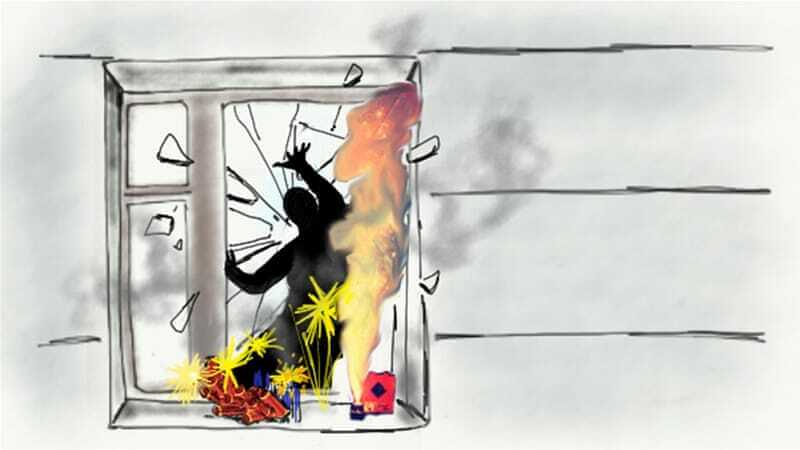 Freital, Germany – On Halloween night, 2015, in this town outside the Saxon capital of Dresden, Abu Hamid went into the kitchen to grab some food when he noticed sparks of light outside the window. Sensing danger, he and his roommates rushed out of the kitchen just as a booming explosion shook the house, shattering the windows and sending pieces of glass into one man’s face. The explosion was caused by illegal fireworks, as they later discovered. It appeared someone had placed them on the windowsill that night to target those inside. For months beforehand, local police had failed to see a connection between a series of right-wing protests against refugee housing shelters and the bombing of a car belonging to a left-wing politician in Freital. Just one month before Abu Hamid’s apartment was attacked, another, almost identical firework attack had been launched on the house of some Eritrean refugees in the town. It wasn’t until news outlets as far away as Berlin began pressuring authorities to take action that Germany’s federal prosecutor took up the case. In a dramatic SWAT-style raid, federal and state police arrested five suspects believed to have formed an organised anti-refugee militia. Read the full story at Al Jazeera. This is the fifth story in a seven-part series.